Billboards are meant to distract and annoy, to draw attention and to not fit in. In its recent on-street ad campaign, IBM promotes its People for Smart Cities Program with billboards that are even more invasive. Ogilvy & Mather France took the concept of the board and bent it into shapes that could – with some effort – be seen as solutions for a somewhat smarter city, Paris in this case. A board bends to become a bench, a rain shelter or a ramp over stairs. It is still visual clutter, it is still preaching something, but at least it is doing it with a bit more imagination than just pushing a loud message. 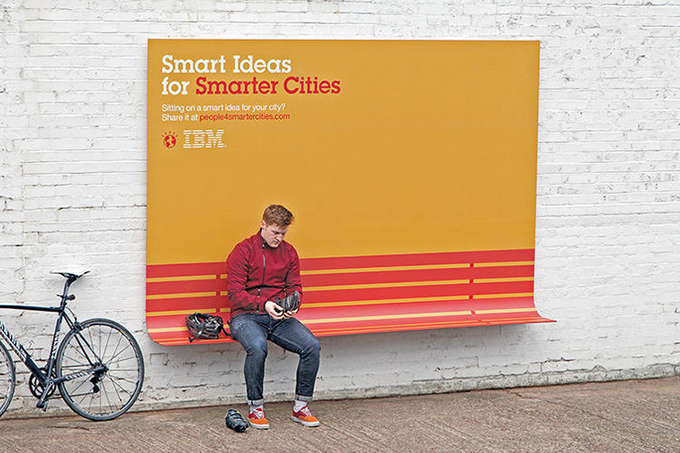 How many citizens actually paid attention to IBM’s message on the street while perusing the practical benefits of the boards, we don’t know, but the social media attention this campaign is achieving has certainly worked its magic. We certainly found ourselves deep in the depths of IBM’s Smarter Planet, Smarter Cities site, reading white papers and studies about retail and merchandising. via The Cool Hunter – Welcome. This entry was posted on June 8, 2013 by Carmen Alia in Cases, News and tagged Ogilvy&Mather, Paris, smartcities.